In This Moment have released a stream of their cover of Phil Collins track In The Air Tonight. Their take on the the 1981 song, which appeared on Collins’ debut solo album Face Value, features on In This Moment’s upcoming record Ritual, which will arrive on July 21 via Atlantic Records. Speaking last month about the decision to cover the track, vocalist Maria Brink told radio station WNOR FM99: “Honestly, that’s one of my all-time favourite songs, since I was a little girl. “It’s just so haunting, powerful, dark and captivating. I’ve been trying to cover that song forever – we just couldn’t quite figure out where and when. So this time we just took a little attempt at it. 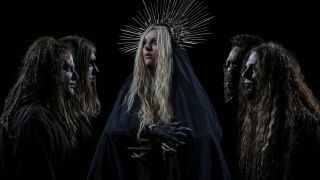 In This Moment previously revealed Ritual tracks Oh Lord and Roots and are currently on the road across the US. The band also feature in the latest issue of Metal Hammer magazine which is on sale now. You can also read Metal Hammer, Classic Rock and Prog free online with a TeamRock+ subscription.